Poor first quarter sees bank revise Vietnam's 2017 GDP forecast. “We have also pared back our full-year forecast from 6.4 per cent to 6 per cent growth in 2017, due to the country’s sluggish start in the first quarter,” HSBC noted in its Vietnam at a Glance Report released on July 19. It pointed out that growth in the first quarter hit a three-year low of 5.2 per cent, in large part due to a slump in electronics exports. Accounting for about 20 per cent of the country’s shipments, Samsung Electronics ended production of its Galaxy Note 7 smartphone in October, impacting significantly on Vietnam’s growth. Fortunately, industrial production picked up in the second quarter as assembly of Samsung’s Galaxy S8 kicked into gear. 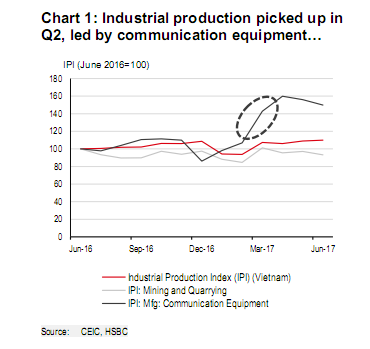 The industrial production index grew 9 per cent year-on-year in the second quarter, buoyed by significantly higher production of communications equipment (Chart 1). Moreover, construction accelerated in the second quarter, growing at 12 per cent year-on-year, up from 4.8 per cent in the first quarter. “The growth in industrial production and services, however, was somewhat offset by a continued slump in the mining sector,” the report noted. Vietnam’s mining and quarrying industry has contracted for the last six straight quarters, including a 7.6 per cent decline in the second quarter of this year. 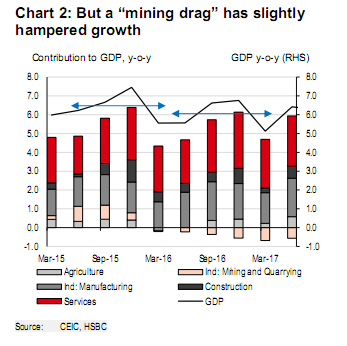 This “mining drag” has been part of the reason why Vietnam has been unable to consistently reach its previously higher levels of growth, despite healthy expansion in other sectors, according to HSBC (Chart 2). The exact reason for the sharp contraction in the mining sector is hard to pinpoint but could be due to a combination of several factors, including a recent fall in coal prices, a higher natural resources tax introduced in July 2016, and higher production costs due to the depletion of easily accessible coal layers. Meanwhile, the extraction industry is mostly controlled by State-owned enterprises the Vietnam National Coal and Mineral Industries Group and PetroVietnam, thereby negatively affecting government revenues. 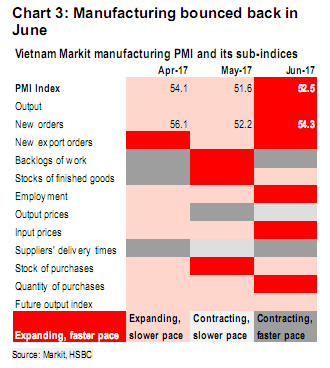 Even so, in a reversal of the previous month’s decline, Vietnam’s June PMI climbed to 52.5, reaffirming HSBC’s view that May’s slowdown did not pose a significantly pressing concern. As previously noted, other high frequency data like trade and retail sales remained strong in May, despite lower PMI figures. June’s PMI saw a rebound in several key indicators that caused concern in May, such as new orders (including exports), output, and employment (Chart 3). New orders, in particular, expanded for the 19th month in a row. “The higher new order numbers domestically and externally also supported a continued increase in output and staffing levels, which both expanded at a faster pace than in the previous month,” it stated. Moreover, a slower expansion of inventories (stocks of finished goods) is a positive sign for future production, even if the export cycle cools off. Vietnam’s hefty bounce-back in the second quarter reaffirms its strong economic footing despite a sluggish start to the year. HSBC expects growth to gain momentum in the second half as foreign investment and agricultural production pick up. “The country continues to receive steady foreign direct investment, which enables it to build international reserve buffers and hopefully diversify toward higher value-added manufacturing,” it said. The second quarter data, however, further highlights the country’s reliance on industrial production and exports (particularly from the foreign-invested sector) to maintain high growth. “Overall, we believe Vietnam’s growth prospects remain promising, despite recent hiccups, and could be sustained with a positive external environment and continuing economic reforms,” the bank concluded.